You open a free-floating dialog window in pCon.planner (e.g. the Image dialog, Material Editor or Properties Editor). The selected window should float in front of the pCon.planner workspace. In your case, it does not. Even if you minimize pCon.planner or click once again on the desired button, the window is still not visible. You have your computer connected to multiple monitors in order to extend your desktop. If you are using this computer with only one monitor, some of your free-floating dialogs will not be visible. The cause for this is that the dialog box appears in the screen area of the non-attached monitor. Another possibility could be that you unintentionally moved the missing dialog box very far to the edge of the monitor. Hold down the CTRL key on your keyboard. At the same time, left click on the start button for the desired dialog. The dialog will appear over the middle of your pCon.planner workspace. The advantage being that the layout of your viewports will remain unchanged. Alternatively, you can open the Start Menu and open the dialog Settings. 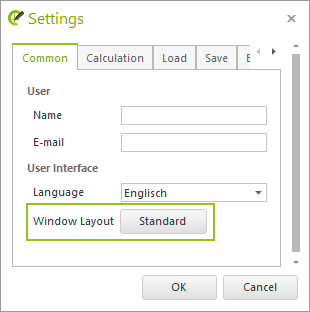 There you’ll find the button Window Layout: Standard under the Common tab. When you click this button, all opened pCon.planner dialogs will close – whether free-floating or docked. The Properties Editor is attached to the right-hand side of the workspace. If you open a new floating dialog, it should appear in the middle of the workspace.